London doesn’t have enough places like Bellanger. 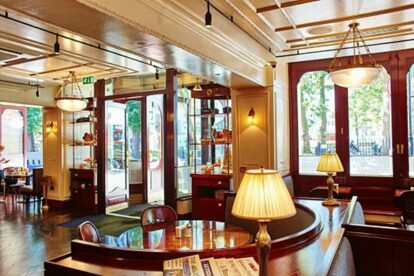 And those that it does have are all up town (like the wonderful Delaunay on Aldwych or the spectacular Wolseley on Piccadilly) so to discover Bellanger on Islington Green is a true delight. This a typical French Grand Cafe / Brasserie that is doing all the things you would hope for and expect: impeccable service with a smile and absolutely no pretensions (it is fine to come here for a coffee and a croissant, or drink at the bar, or have a three-course dinner for 12, or stop in for a breakfast or lunch or brunch or whatever you fancy). For example, when people come with their dogs to have a coffee and read the (free) papers dog bowls are brought over full of water. No questions asked. Babies are welcomed. So are wedding parties. So are intimate tables for two in a private dining booth. I’ve even come here after two courses at a nearby restaurant just for pudding and a digestif! Nothing phases the staff and everything on the menu is quality. Actually, that is the perfect word for Bellanger; quality. The staff, the decor, the food, the wine list, the bar. Everything is done with an effortless and seamless quality. If you are in the area stop by at any time of the day and you will be pleased you did.